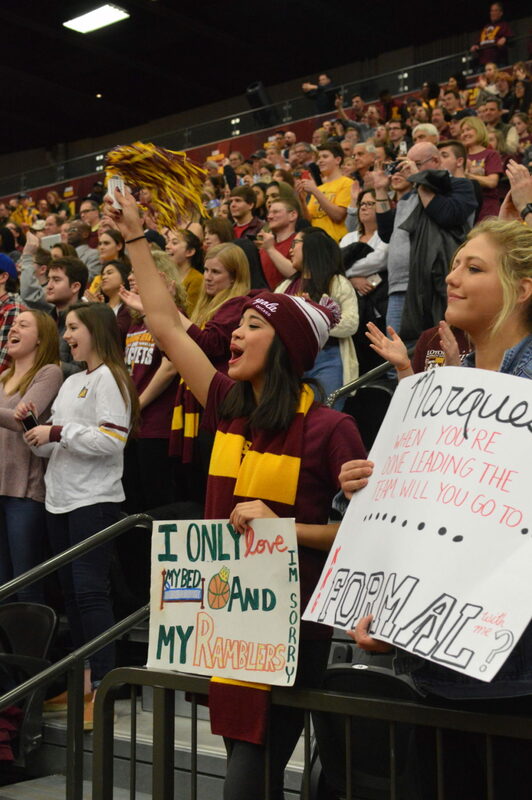 Alanna Demetrius | The PHOENIX Loyola’s fans cheer as the Ramblers return to campus following the Elite Eight. After making it to the Final Four for the first time since 1963, the Loyola men’s basketball team (32-5, 15-3) was welcomed back to campus at a rally in Gentile Arena March 25. Students and fans packed the lower bowl as head coach Porter Moser, his staff and the players gathered onstage to celebrate their first NCAA Tournament semifinal appearance since the 1963 Loyola team won the national championship. Afterward, players met with the media and fans stayed to get autographs and photos. Senior Ben Richardson asked the fans to look around Gentile Arena and take in the moment. He said the team is trying to make Loyola fans proud and support them. After the rally, Moser said he was proud of his players and said he was grateful to be leading them to the Final Four. The No. 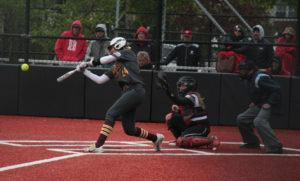 11 seed Ramblers are scheduled to take on No. 3 seed University of Michigan in the Final Four March 31 at 5:09 p.m. CDT. The game will be broadcast on TBS.